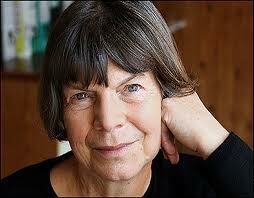 Margaret Drabble is one of the most renowned novelists in the late 20th and early 21st centuries. I have read many of her novels, and to my surprise, I recently discovered she had also written a number of short stories. I reviewed those stories last year, and I was thrilled at the opportunity to see an entirely different side of her as a writer. Her latest novel, The Dark Flood Rises, tells the story of a woman who decides to explore lots of places in England she never visited. At first, I was afraid this might be depressing, but it turned out to be anything but. Fran Stubbs is twice divorced. Her second ex-husband recently passed away, and her first husband Claude, is seriously ill. She cooks several meals a week for him, and they revisit a lot of the old times they had. Fran also has a number of women friends, and they do a lot of things together. The “Envoi,” at the close of the novel, is something of a pleasant ending. As is the case in many of the literary fiction novels I love so much is the detailed vocabulary, the references to most of the American and English novels I admire, as well as lots of introspection illuminated by an omniscient narrator. Here is a sample of her thoughts. Drabble writes, “Her new-old friend Teresa, who is grievously ill, wouldn’t be censorious, as she is never censorious about anyone. // I am the captain of my fate, I am the master of my soul. A Roman, by a Roman, valiantly vanquished” (2-3). A few pages later, she writes, “England is now her last love. She wants to see it all before she dies. She won’t be able to do that, but she’ll do her best” (5). “Fran doesn’t meddle with her children’s lives” (11). Fran’s favorite places to stay while on her excursions are a chain motel. Drabble writes, “There is something robust and cheering about the sight of the Premier Inn Full English Breakfast and those who are devouring it. It is even better than the bright red dinner. Fran doesn’t go for the Full English herself, but requests a soft-boiled egg with toast. She would quite like to go over to the side table to make her own toast, but the not-so-young young woman labelled Cynthia, Cynthia with her chalk-white face and her raven-black hair, is so helpful and eager to please that Fran surrenders and allows herself to be waited on. All around Fran, younger people in their thirties and forties and fifties tuck into friend eggs and bacon and beans and hash browns and mushrooms and fried tomatoes and fried bread, all wielding their cutlery with an air of gusto. Condiments flow, the red and the brown and the mustard-coloured, and loud piped music resounds. Both Claude and Hamish would have hated the piped music, but Fran doesn’t mind it at all” (21).